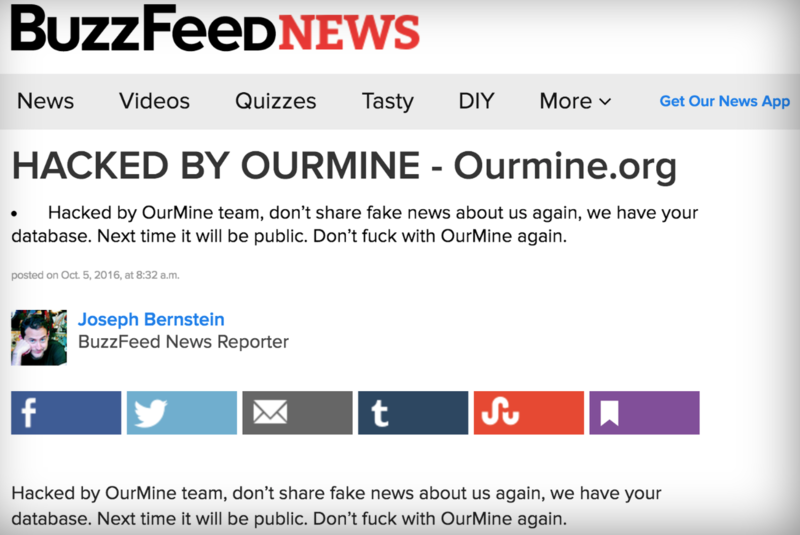 OurMine Hacks BuzzFeed Over An Alleged "Fake News"
The page has since been removed from the site. The author, Joseph Bernstein, whose post has been messed up, recently wrote a piece about OurMine. He claimed it was the brainchild of a “soccer-obsessed high-school student,” under the headline “This Saudi Teen Is Probably Behind the Hacks of Dozens of Tech CEOs.” OurMine initially denied the report, releasing a statement claiming that the person was “just a fan” of OurMine. Today’s vandalism tells a different story. The hacking group is notorious for breaking into social media accounts of several prominent users, including CEOs of Facebook, and Google. The hackers have threatened the publication to openly publish BuzzFeed’s database, however, the group didn’t say what kind of information this database contained.